Lawyers have been at the bench for about 10 minutes now presumably talking about whether K 80 stays or goes. Here is the article referenced in the below retweet to David Ovalle (@DavidOvalle305) Note the article is dated May 25, 2012 It has to do with the OBEY clothing artist. June 13, 2013 Tweets Cont. 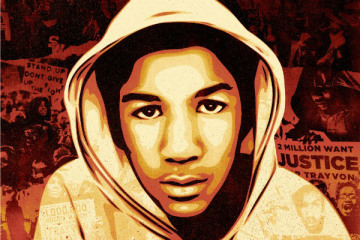 It was probably bound to happen: L.A. street artist and Obama “Hope” poster creator Shepard Fairey has turned Trayvon Martin into an icon. Just go ahead and put the icon on a USPS stamp already. Why not a Nat'l TM day? @JeffWeinerOS Didn't judge in Casey Anthony murder case keep jurors' names secret for a "cooling down" period after verdict? Sequestration is best but I think the trial will last longer, at least based on all the defense delays in the Arias trial. Hope you're drinking your iced tea and staying cool Alagary. I think the trial will last longer than the 2 to 4 weeks too. The defense delays in the Arias trial was crazy imo. And although it's quite OT in this thread, I'm really curious about alagary's chickens. No "It's five o'clock somewhere", eh?! @kathic1016 It means 1 of 2 tweets when there's a lot of info. The second tweet is 2 of 2. I have 30 acres , free range usually between 30- 75, depends on weather and hawks. Sell eggs for beer money and donate extra to local food bank. This potential juror, K-95, is a white female, maybe in her 40s-50s, does not put a lot of weight on media reports; former HOA member. #GeorgeZimmerman voir dire: 19 of the 29 potential jurors questioned so far are women, 14 of them white, one Asian, four African-American. Page created in 2.264 seconds with 19 queries.